Last week I made a gigantic run in my pantyhose. I’ve never been happier to destroy a pair of good tights (I knew the Easter eggs were coming up!). Pantyhose work best. You can buy a cheap pair for a couple bucks, but foil is a good alternative. I tested both. The dye is au naturale; the woodsy tones are extracted from onion peels! Some people prefer red onion, but the color gets pretty dark; I like the yellow onion mo’ betta. This whole process of dyeing Easter eggs took me 30-40 minutes and that’s with cooking them in 2 batches. Not bad. It’s easier than it looks. 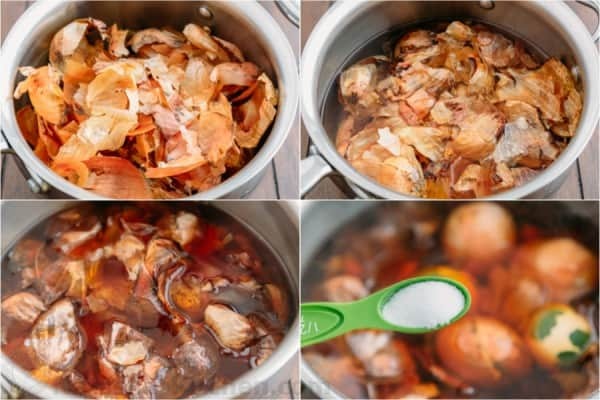 Fill a medium pot with 2/3 of the onion peels and add water until it’s about one third full. Boil for 10 minutes to allow the onion to release it’s color then add 1/2 Tbsp salt. While this is cooking, start on your eggs. Note: foil does not hold herbs well enough; if you want the herb prints, you really NEED nylons. 1. Wrap cilantro, parsley or whatever herbs you wish to use around the egg. 2. 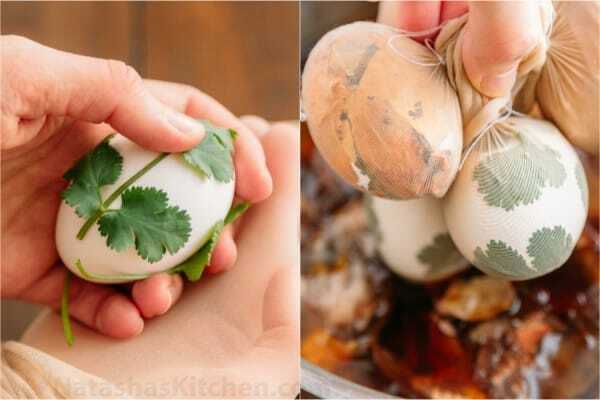 Pull the stocking over one hand and place the egg over it, grab a hold of the egg with your stocking hand and wrap your fingers around it being careful to keep the herbs from folding or wrinkling. Invert the stocking over the egg then tighten and twist at the base. The stocking should wrap snuggly around the egg to keep the herbs in place. 3. Tie a string around the base to secure the stocking. 4. Boil for 10 minutes making sure the eggs are fully submerged then remove from water, let cool until they are a safe temperature to handle, then use scissors to cut away the stocking. Wipe away herb remains with a paper towel. 1. 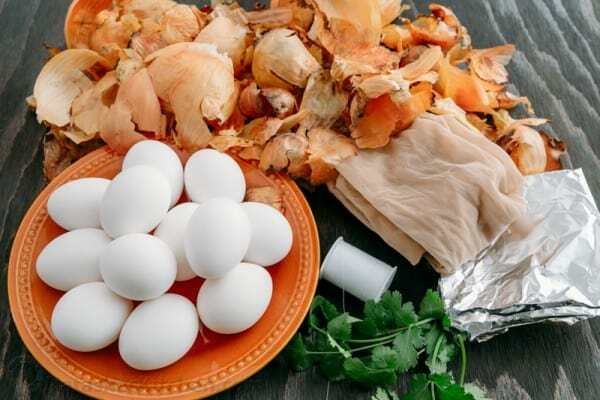 Wrap each egg with enough onion peels to cover the surface; there should be no white showing. 2. Pull the stocking over your hand and place the egg over it, grab a hold of the egg with your stocking hand and wrap your fingers around it. Invert the stocking over the egg then tighten and twist at the base. 4. Boil for 10 minutes making sure the eggs are fully submerged then remove from water, let cool until they are a safe temperature to handle, then use scissors to cut away the stocking. I like shiny things. 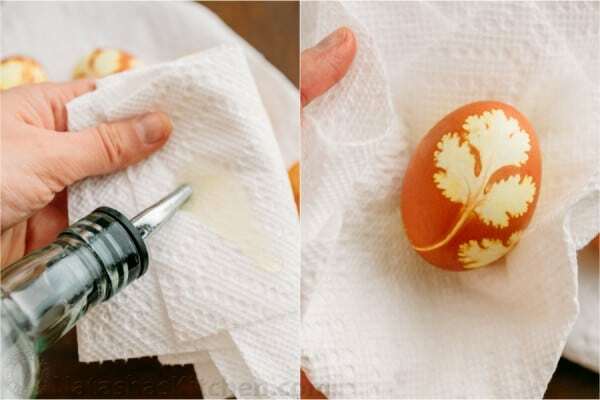 You can make these shiny by putting oil on a paper towel and rubbing the eggs with it. Now take a picture and impress all of your friends on Instagram (I’d love to see your creation too: @natashaskitchen). Oh and one more thing, these make for egg-cellent egg wars (you know, knocking the eggs against each other) I think the trick is to wrap your fingers close to the end you are going to knock. 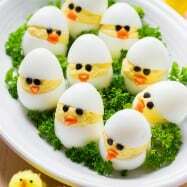 I know it’s early, but Happy Easter Everyone! A few sprigs of fresh herbs parsley, cilantro, etc. Fill a medium pot with 2/3 of the onion peels and add water until it's about 1/3 full. Boil for 10 minutes to allow the onion to release it's color then add 1/2 Tbsp salt. While this is cooking, start on your eggs. 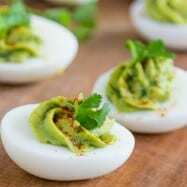 Wrap cilantro, parsley or whatever herbs you wish to use around the egg. 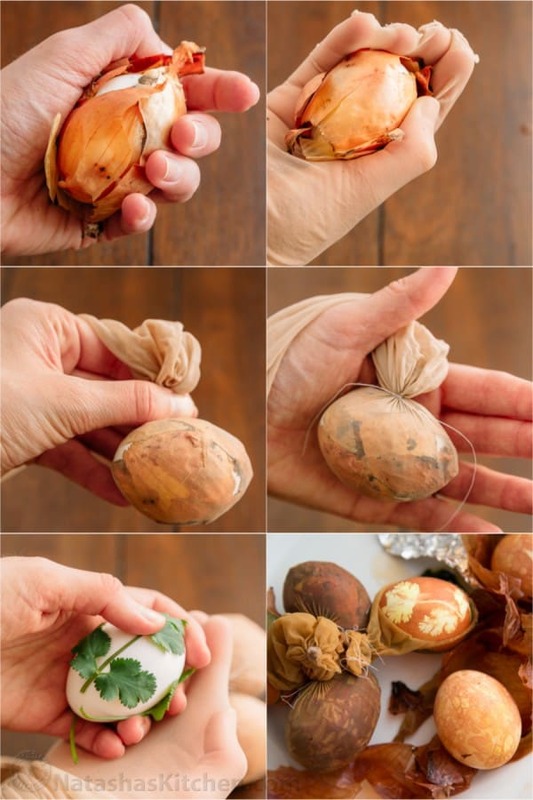 Pull the stocking over one hand and place the egg over it, grab a hold of the egg with your stocking hand and wrap your fingers around it being careful to keep the herbs from folding or wrinkling. Invert the stocking over the egg then tighten and twist at the base. The stocking should wrap snuggly around the egg to keep the herbs in place. Tie a string around the base to secure the stocking. Boil for 10 minutes making sure the eggs are fully submerged then remove from water, let cool until they are a safe temperature to handle, then use scissors to cut away the stocking. Wipe away herb remains with a paper towel. 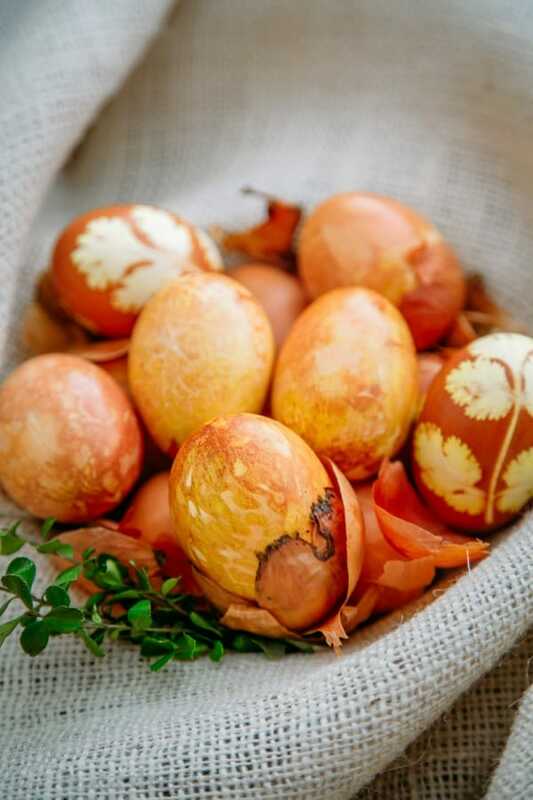 Wrap each egg with enough onion peels to cover the surface; there should be no white showing. Pull the stocking over your hand and place the egg over it, grab a hold of the egg with your stocking hand and wrap your fingers around it. Invert the stocking over the egg then tighten and twist at the base. Boil for 10 minutes making sure the eggs are fully submerged then remove from water, let cool until they are a safe temperature to handle, then use scissors to cut away the stocking. 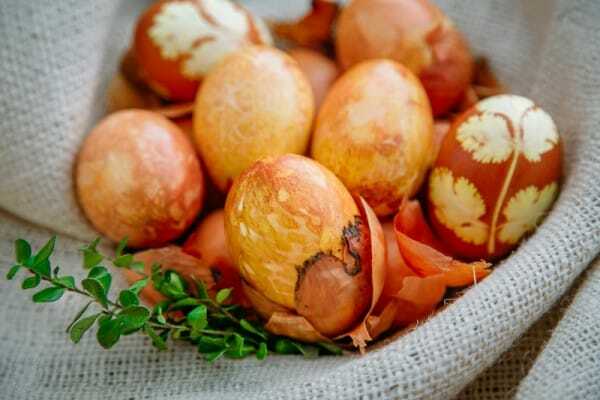 Cut the eggs into the pot directly with the onion peel; no pantyhose required! 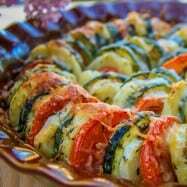 Cook 10 minutes (longer if you want a darker tone. 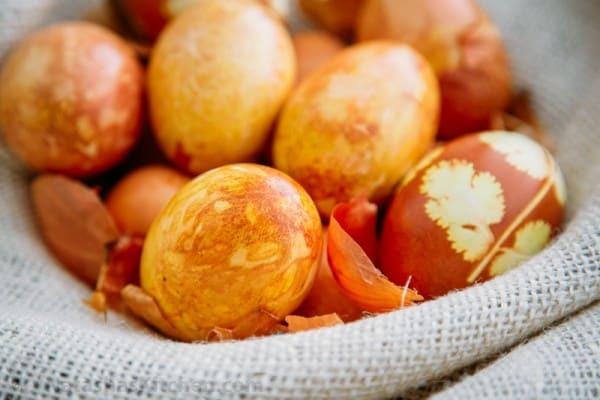 Pour some oil on a paper towel and rub the eggs with it. Thank you!!! I did this yesterday and it worked out perfectly. 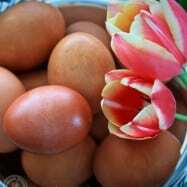 The eggs I dyed were not totally white because they were from a farm. It worked anyway!!! 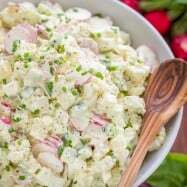 Just discovered your website and I feel like you are a long lost relative! 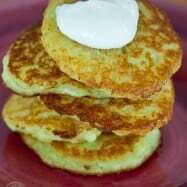 I’m of Polish, Ukrainian and Lithuanian descent. 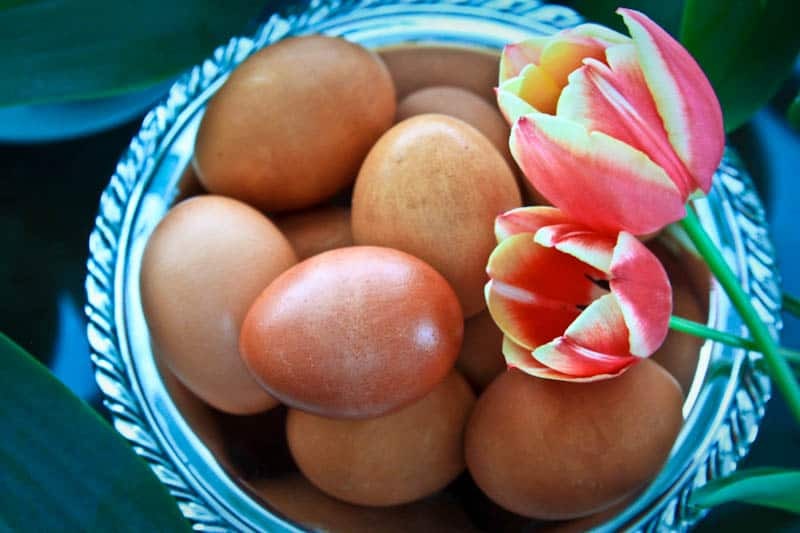 I truly thought that the annual Easter egg wars (in our family called “epper the eggs”) was just something silly we did. These came out really nice Natasha! 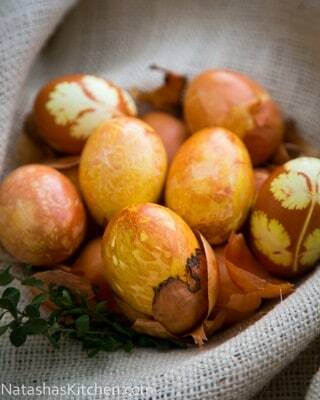 Check out my Blog for another natural way to decorate Easter eggs.